Growing Kale is easy. A leafy vegetable is categorized with “Cooking Greens”. The leaves can be ornamental, but if used as an ornamental, they become too tough to eat fresh. 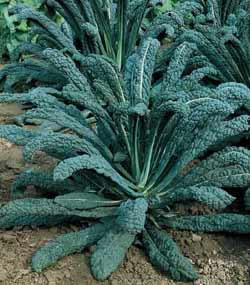 Kale is in the Brassica genus as well as Broccol, Cabbage and Brussels Sprouts. Viruses - There are several common viruses that can affect cole crops including Turnip mosaic virus and Kale mosaic virus..
'Hanover Salad'- Fast growing and early harvest. 'Lacinato'- An heirloom Kale with thin puckered leaves. Can be harvested after a snowfall in some areas.